Wesley Reynoso: Born in La Isabela, Dominican Republic, has studied at the Instituto de Musica Sagrada in San Juan, Puerto Rico; The French Conservatory; Harlem School of the Arts; Wayne State University in Detroit, Michigan. Reynoso has played alongside some of the greatest musicians in the industry including: salsa greats like Alfredo De La Fe, Rey De La Paz, Paquito Guzman, Herman Olivera, and Hector Tricoche; and jazz greats like James Carter, Café Da Silva, Romero Lubambo, Paul Keller, Joe Lovano, Steve Turre, and Antonio Sanchez. He has also performed with Latin jazz artists such as Memo Acevedo, Richie Flores, Luis Quintero, Roberto Quintero, Alfredo “Chocolate” Armenteros, the late Patato Valdez, and Dave Valentin, and most recently with his Wesley Reynoso Afro-Latin Jazz Orchestra in New York City, and also with vocalist Thalia. 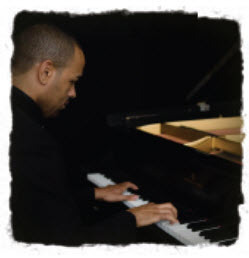 His stylish playing and profound understanding of Latin-Jazz piano make him an exciting performer to see and hear.